Why philosophy degrees are among the MOST useful. Evidence demolishing myths peddled by philosophy bashers. Some very good answers to "Philosophy? What are you going to do with that?" question. Go here. Print off a couple of the articles and attach them to your application, with a polite note saying - "some information about my degree choice". I'm not sure though which is the cause, is it the philosophy degree itself or are the students themselves who are possibly the cream of the crop as undergrad philosophy students tend to be in this group. I cannot see someone with poor A-levels choosing/ reading Phil. Hehe. On the first day of my first MBA course, the professor asked each of us to introduce ourselves and give a little personal background. My undergraduate is in music, so that engendered a bit of conversation, but not as much as one of my classmates who told us that he had a BA in history, and then, because that only made him probably unemployable, returned to get a masters in philosophy to further decrease his chances. Since the graph only plots verbal/written (reasoning I presume) scores, is there any data on how philosophy undergrads do on numerical testing? 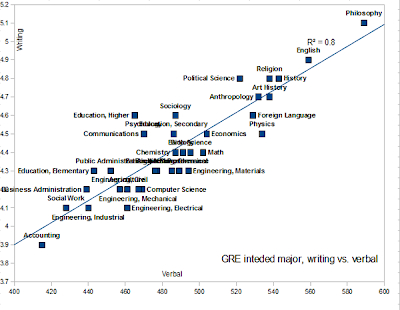 Additionally, doesn't the GRE test get a bit of flak for being quite a rigid format - potentially the particular test format favours philosophy students without them actually being able to perform better than students of other disciplines in 'real-world' or different examination style settings? (note: I've only skimmed your post/the links as I'm at work, so some of my questions may have been dealt with already). Interesting, I imagine a philosophy degree helps develop your comprehension skills along with teaching you how to ... think... for lack of a better word. I do think that for some careers - primarily vocational - it is better to get a grounding in the core subject. Engineering for example, too often I encounter bright people with 1 year conversion courses who lack knowledge of the basic principles that any engineering undergraduate would know. "Who is the Principle Engineer?" Just to be provocative, do these sources control for analytic vs. continental trainings? Numeracy not included. I wonder why not? Hell, who needs numbers if words will do. Only boring people think about numbers. I recently watched Charles Ferguson's 'Inside Job' on the global financial crisis. What soon became apparent was that most of the antagonists were pretty good at convincing people that they knew what they were talking about, when with hindsight it was clear they didn't. No wonder philosophers do well in business. I have studied both humanities and science subjects at a tertiary level, though I'm one of those people who never finish their degrees. What this is saying, I believe, is that people who study philosophy develop good written communication skills and, hopefully, good verbal communication skills as well. I work in engineering and I would argue that problem-solving is the most important skill, and that includes many areas like politics and economics, not just technical environments. If one examines the recent Fukushima disaster, there are a number of problems to be solved: technical, political, strategic, social, economic; and they all require intelligent debate. From my experience of studying philosophy, I would argue that analytical and critical thinking are the mental attributes that get exercised most regularly. Recently came across your blog, and as a current philosophy student, I'd have to agree. Although, I echo others' sentiments about employers not offering jobs but implying that someone should... Perhaps I should be a bit more aggressive about my qualities in the future. As a philosopher it's probably not surprising that you obviously don't understand what a selection effect is. If you had to do real experiments with data you would understand that you need to control for the ability of graduates on the way in to university as well as the way out - this is the cause of your selection effect. MW. Doh, yeh I never thought of that! 1) The GRE also has a math portion - it doesn't do to forget that. Just sayin'. 2) About 55% of Engineering students with aspirations of graduate study are international (from India, China, S. Korea and so on), where learning English isn't highly emphasized. Consequently, their verbal and writing scores are low. A more interesting analysis would be to compare Writing scores vs Math scores, and Reading scores vs Math scores. 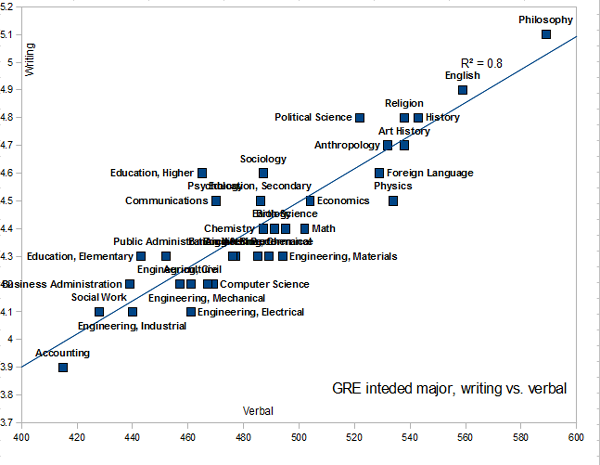 This, I think, would provide a better sense of which majors create "well-rounded" individuals. "Philosophy? What are you going to do with that?" "Nothing, but I will go back to school to get a degree that actually means something." I should add that I am joking around. :) Great article and thanks for posting the information. What I think it means is that you can get a degree in anything but it doesn't mean that you will learn it easily or that you'll understand all the applications of what you learn. What philosophy does is not to only contemplate deep subjects but also to think more clearly, analytically and rationally. Philosophy creates problem solves. That is why philosophy majors do best when they double major or minor in something else. By carrying their knowledge and skills from philosophy they will improve and do better than most other in any field they move into. Philosophy majors tend to score in the top 5 of any other majors for all graduate school tests, such as the LSATs, GREs, GMATs etc. I'm working on finding a job by using my philosophy degree right now, but not just a teaching job. I'm thinking about combining philosophy with psychology to be a therapist. Combining existential therapy with normal therapy and also something new called Philosophical Practitioning. Loved this post by the way. Nice to see this kind of reaction to my degree. McNeese U has rearranged their web site, breaking your links. Thought you'd like to know. But thanks for a refreshing article. Broken links. Please restore! I currently study PPE at Warwick so would love to hear what people are saying about where philosophy gets you. Would be a useful counter to my dad who wants me to do an MBA and not an MA in Philosophy and Literature (facepalm). I am Salman Arshad from India and now 38 years old. I have known philosophers, astro-physicists, designers, mathematicians, sociologists and environmental scientists who were allowed into The City. It isn't your degree. It's your lack of humanity and slight psychopathic tendencies that will get you a job in business. This article focuses on what a learner should take into consideration when choosing the right accelerated online degree program. Some very useful tips are written to make it easier for an online learner to make a decision. You gotta see this for the details. I come from Poland, sorry for my English. I think Philosophy can possibly (depend on student) teach you 'better' thinking - here logic (especially philosophical logic) and methodology as a tools for clearer distinguishing of ideas, meaning of words and the range of them. Also student have chance to improve ability to thinking abstractively - ontology, epistemology and huge amount of history of philosophical ideas make difference and 'bend' student's mind in different shape. Of course as always it depend on individual's ability, aptitude and attitude. What do you think about this explanation?--Philosophy, being among the most abstract and systematic subjects at the university, tends to attract very talented students. And very talented students tend to find their way in the world.